Imagine being woken up in the middle of the night by the sound of a SWAT team stacked outside your front door, ready to burst inside your home as they carry out a ‘high risk’ court order to seize your firearms! Before you know it, your entire gun collection has been confiscated, and you are told that if you want your firearms back you will need to retain a lawyer and go before a judge sometime in the next 3 to 12 months! Just like that, without ever being charged or convicted of ANYTHING, you have lost your right to keep and bear arms, possibly forever. This is the reality of ‘Red Flag Gun Seizure’ legislation, a law that is already in effect in eight states — and it is the TOP PRIORITY of anti-gun radicals in St. Paul! In fact, the bill (House File 9) was introduced by Representative Ruth Richardson and Representative Dave Pinto and has already racked up an incredible 35 co-sponsors! Senator Ron Latz has already promised Michael Bloomberg’s forces in St. Paul that he will be rolling out a Senate companion bill in just a few days. I’m afraid that without your immediate action, these gun control zealots will be successful at ramming this bill into law, before you and I can mobilize enough gun owners to stop it! That’s why I’m counting on you to please sign your petition to the members of the Minnesota Legislature, demanding your State Representative and State Senators oppose House File 9.
opposed to this scheme –- especially as the bill is gaining support in the Republican caucus! If enacted, ‘Red Flag Gun Seizure’ legislation would allow virtually anyone to make a claim that you are a danger to yourself or someone else and ask a judge to order you stripped of your firearms. >>> These gun seizure orders will be issued before you have been convicted, or even charged, with anything! A gun owner with absolutely no criminal background of any kind, can have his firearms seized before he ever sets foot in a courtroom. You would have more due process rights in traffic court than you would in defending your constitutional right to keep and bear arms. >>> The hearing that determines whether or not to strip you of your firearms happens in secret! Known as ex-parte proceedings, these hearings take place in your absence. You will have no ability to question your accuser, provide your own evidence, or testify in your own defense. >>> The order to have your firearms seized can be automatically renewed by an anti-gun judge for another year! The bill would allow a judge to order that the gun seizure order remain in effect for an additional year following its expiration on his own initiative, or after being petitioned by a county attorney. Given how much opposition we’ve seen to our gun rights from the Minnesota law enforcement and judicial system over the last few years, we know that this unconstitutional power could be greatly abused. Simply put: this is the most aggressive attack on our gun rights that we’ve ever seen here in Minnesota, as it allows you to be stripped of ALL of your gun rights by the stroke of a pen! That’s why it’s critical that you sign your petition telling your lawmaker to STOP, BLOCK and OPPOSE this legislation! No gun owner wants a criminally deranged person walking around carrying a gun. But there is already a process in place to deal with people like that. Under current law, those who tell others of their intent to kill can ALREADY be arrested for making threats if law enforcement is informed. Those who are exhibiting ‘warning signs’ that they may be planning violence can — at a minimum — be interviewed by law enforcement who can move to arrest the person if needed. As anyone in law enforcement will tell you, you can tell A LOT about a person’s intentions with the answers to just a couple questions. But they’ll also tell you that no gun control law on the books will ever stop crime, especially if law enforcement fails to do its job like we saw in Parkland, Florida last year. Gun-grabbers know all of this, but they don’t care. They are hoping that the surging Republican support for this legislation around the country will allow them to muscle the necessary votes from ‘across the aisle’ to pass this bill into law this year. Sadly, they might just get their way without your immediate action. That’s because Republican Senator Scott Jensen is openly flaunting his desire to support the gun-control agenda in St. Paul this session! So please don’t think for a moment that this bill is not a threat because we have Republicans in control of the Senate. On the contrary, we need to make sure that every lawmaker in St. Paul –- Republican and Democrat alike — knows they will pay a steep political price if they even think about backing this bill! Your signed petition is crucial, as it allows MGR staff in the Capitol to show your lawmaker that you are opposed to this legislation. But in addition to your signed petition, I hope you know that I am counting on your immediate financial support, too! As you read this, Minnesota Gun Rights is preparing a massive mobilization program, designed to activate tens of thousands of gun owners into opposing this bill. >>> A large scale email and direct mail program, designed to get tens of thousands of petitions signed in opposition to this program. >>> A growing statewide media tour. Already I’ve been interviewed by WCCO, KARE11, and KSTP News 5, but we need to expand this program even further. >>> A state-of-the-art Internet and social media campaign exposing any politician who dares to support this bill. >>> An unrelenting radio and TV ad campaign, to highlight the details of this bill and ensure that gun owners are flooding the Capitol with calls, in advance of any vote. I’ll fight as long and as hard as I can, but we need to be able to fund these crucial programs. So please consider an especially generous contribution of $250 or $500, if possible. I know that’s a lot of money, but we need it NOW. ‘Red Flag Gun Seizure’ legislation is the most dangerous threat that we have ever faced in St. Paul, especially with so many Republicans openly talking about voting for it! So if that amount is just not possible, I hope you’ll consider $100, $50 or at least $25. If Bloomberg radicals are able to DESTROY the cherished American concept of ‘innocent until proven guilty,’ our rights will be eroded bit by bit until we have no freedom left! We have to fight back -– please stand with us now! P.S. Representative Ruth Richardson has filed House File 9 — ‘Red Flag Gun Seizure’ legislation — and already has an astounding 35 cosponsors! 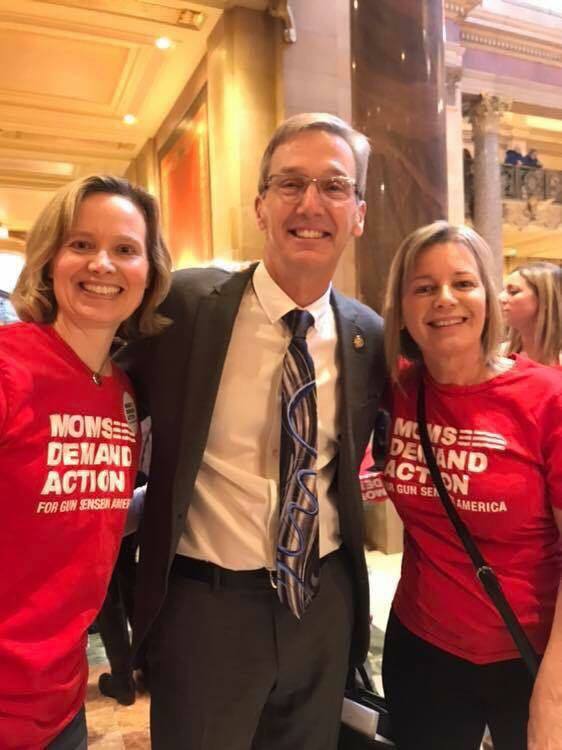 Even worse, Minnesota Gun Owners Caucus-endorsed Republican Senator Scott Jensen is openly talking about his plan to back the gun-grabbers agenda (see picture above), meaning that this bill MAY HAVE THE VOTES TO PASS THE SENATE! Once passed into law, this bill would allow your firearms to be confiscated before you have even been charged, much less convicted, of anything! Please click on the link and sign the petition, helping us to show lawmakers in St. Paul that they will pay a heavy price if they support this bill. And please include your most generous financial support right away, so we can mobilize an army of gun owners!